35 years old as a band in 2016, loved by Nirvana, Teenage Fanclub, John Peel, Stewart Lee, Built To Spill and almost every 6Music DJ and many young bands. No one leaves a Shonen Knife gig without a smile on their face and while their songs are usually food or cat based the music has grown from punk, pop, heavy post-punk to include an English 70’s hard rock edge which may change with their 20th album due out next spring. 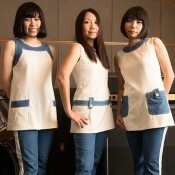 Shonen Knife are a ground-breaking all-female Japanese, pop-punk rock trio formed in Osaka in 1981, when Naoko Yamana first heard late ‘70’s punk-pop, particularly The Ramones. Inspired, the band crafted their own idiosyncratic songs, fashioned brightly coloured outfits and DIY albums. In 1985, K Records released ‘Burning Farm’ in the United States. Deals with Sub Pop and various majors followed. 1989 saw the crème of the alt. rock scene (including Sonic Youth, L7 and Redd Kross) covering their favourite Shonen Knife songs on the tribute album ‘Every Band Has A ShonenKnife Who Loves Them’. They toured with Nirvana (on the ‘Nevermind’ tour), The Breeders, as part of Lollapalooza, wowed the Reading Festival and Roskilde, recorded sessions for John Peel and appeared on MTV’s ‘Beavis and Butthead’. The band returned to the UK after a gap of 16 years in 2009 and since toured regularly throughout Europe gaining many generations of fans. 2016 will be the band’s 35th year of rock and will see them release their 20th studio album. With no signs of slowing down, Naoko continues to say: “Let’s Rock!”.